Click on the thumbnail for a large picture. If ever a plant was mis-named, hogweed is it. This is a wild vegetable as good as any you can buy. Roger Phillips in his book 'Wild Food' says This is unequivocally one of the best vegetables I have ever eaten. The only downside is it's common name! Hogweed is a member of the celery family (umbelliferae) and is actually nicer as a vegetable than braised celery. However - the taste is not at all like celery. Hogweed tastes like - hogweed. I know of nothing else similar. Hogweed has a distinctive and pleasant smell when the leaves are bruised. 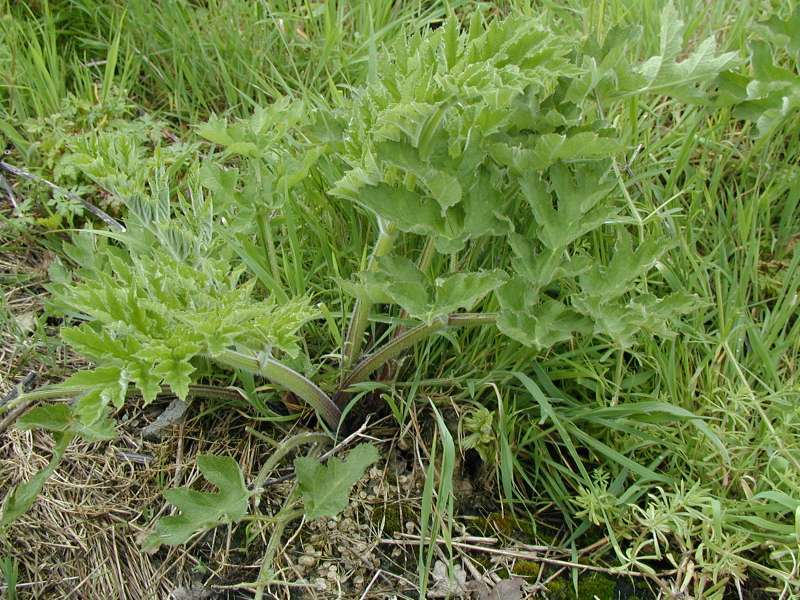 The picture shows a young hogweed plant growing, as it typically does, on waste ground. Roadside verges are also a common environment. The plants are usually buried in grass, nettles, docks and other vegetation. Hogweed probably gets its name from its texture: the plan's stems and leaves are very hairy, even bristly. That alone is probably enough to make the uncooked plant seem unpalatable to most, but when cooked, the stems lose this hairyness. Also, the young stems have the most delightful texture when cooked: there is not a trace of stringiness. The part to pick are the young leaves and flower peduncles: the stalks are slightly nicer than the leaves and the leaves to chose are those that are not fully opened. The picture has three such leaves, the two to the left (at 10 o'clock and 11 o'clock) and the one at about 2 o'clock. These constituted a part of our Sunday lunch. If the leaves are even tighter furled, that's fine. 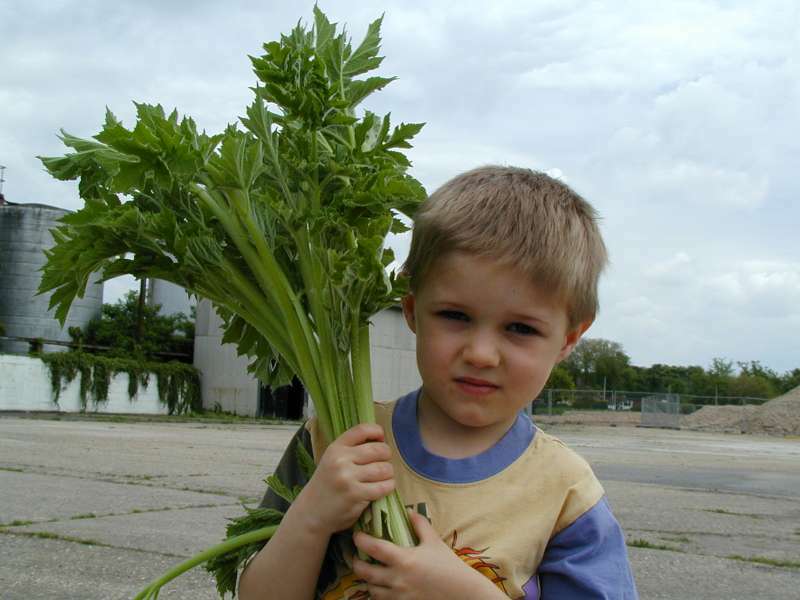 A picture of my son, age 6, with the harvest. The whole plant is edible. Young stems and peduncles are best braises it as you would celery. Roots can be treated as parsnips - indeed another name for the plant is cow parsnip. Older parts are generally a little fibrous so are less palatable. Be warned that Giant Hogweed (Heracleum mantegazzianum) is dangerous: the sap contains furocoumarins which, on contact, photosensitize the skin causing blistering by sunlight, which can be serious, especially in children. There's not a lot else which you could mistake for ordinary Hogweed. The plant pictured is a baby, as they are more likely to be if you try to harvest them accidentally. Giant hogweed is a huge plant growing to 3.5 metres high and having stems up to 10cm thick. But once you have seen a giant hogweed, you are unlikely to mistake the two - although ordinary hogweed is quite variable. The picture below shows Giant Hogweed growing on the bank of a ditch beside Ranworth Broad, taken 30th April 2006. At this stage the two are not dissimilar! Giant hogweed is generally a darker green and usually has more spiky leaves. That's it in a row just behind the primrose. first published 20th May, 2001. Page © 2001-2019 Richard Torrens.